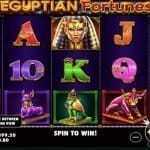 Go Bananas is 20 paylines and 5 reels video slot game powered by Netent software platform. This casino slot has minimum coins per line 1 and maximum 10, while coin sizes for the game ranges from 0.01 to 10 per spin. 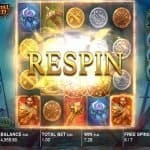 The casino offers a jackpot of 700 coins on your total bet and return of player percentage is 96.9%. 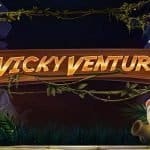 You can play Go Bananas slot at any NetEnt casino site for free or with the help of real money. 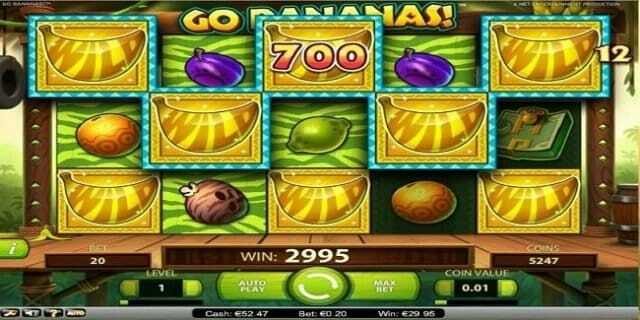 Go Bananas slot is inspired by jungle and related theme. The game contains several wild symbols including various Monkeys. You should adjust coins per line and coin size before starting the game in action and for that you will have to know the options available in this game. “level’ option can be used to adjust the bet level, ‘Coin Value’ can be used to adjust the coin size for per spin and “Spin” button is used to hit the reels in motion. The game also includes buttons like “Auto Play” and ‘max bet’ and it means you could play the game many times without any interruption using ‘Auto Play” option and could play the game at the highest wager if choosing “max bet” option. As mentioned, the game posseses several wild symbols such as wild Gorilla, Orangutan, baboon, Langur and wild Tarsier and they will form a great winning combination. They will increase the chances of your winnings. If a player lands on 5 Diamonds on any active reel, 700-coin jackpot will be awarded to him or her.